Steve Nash’s return continued to bolster the Los Angeles Lakers’ drive, Jeremy Lin’s recent strong play helped Houston upend Chicago, and Mario Chalmers had his best game of the season yet in Miami’s big win over the Thunder. Three different guards. Three different stories. Three different ways to win. Steve Nash, the two-time MVP, played his second game back after his leg injury, and he didn’t disappoint one bit. He poured in 16 points on 7-of-12 FG shooting, playing 38 minutes as LA’s starting playmaker. He also dished out 11 dimes while grabbing 6 rebounds as the Lakeshow displayed just how good they can be when all four of their future Hall-of-Famers are playing well. With Nash’s superb quarterbacking, Kobe Bryant also didn’t need to do much aside from scoring. Kobe finished with 34 markers and only 1 assist, but there’s no doubt he’s happy to walk away with a W – the Lakers’ fifth straight. keep the Lakers' deep pool of talent together. Jeremy Lin, meanwhile, left no doubt about who the Rockets’ #1 playmaker is, putting up 20 points and 11 assists while having one of his best shooting games of the season. The Taiwanese-American converted 8 of his 12 field goals and made all 4 of his freebies. Lin has been on-target of late, shooting better than 58% from the floor, and that obviously bolds well for Houston’s chances. He’s also been a more balanced point guard, distributing the rock better than he did at the start of the season. In the past three games, all of which were Houston victories, Lin has normed 9.3 assists per outing. Suddenly, the voices doubting his lofty contract have become silent, and if Lin becomes consistent, then perhaps he will meet his potential sooner rather than later. 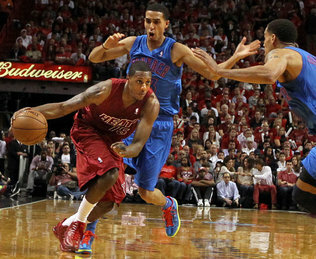 Out east, Mario Chalmers entered the nationally televised Heat-Thunder match shooting poorly from beyond the arc. He did make 4 treys against the T-Wolves last week, but his success rate has dropped to only 20% since then. Against OKC, however, Super Mario busted out the big guns and showcased the form that made his production so critical in the 2012 Finals. Chalmers shot 8-of-14 from the floor, including 4 triples, while also collaring 3 boards and handing out a couple of assists. He thoroughly outplayed his counterpart on the other end, Russell Westbrook, who missed 14 shots and turned the ball over 5 times. If Chalmers can untangle himself from his usual boom-or-bust self and find some measure of consistency, then it’s a no-brainer that the Heat have the inside track to another romp all the way to the NBA Playoffs. Rajon Rondo supplied a game-high 19 points, and the visiting Boston Celtics posted a 93-76 victory over the Brooklyn Nets on Christmas Day. Rondo added six rebounds, five assists and three steals for the Celtics, who had entered the Barclays Center on a five-game road skid. Boston rookie Jared Sullinger made 6-of-7 field goals to finish with 16 points, while fellow reserve Jeff Green scored 15. Gerald Wallace and Brook Lopez had 15 points apiece for Brooklyn, which fell to 3-9 in December. The top two scorers in the NBA engaged in a Christmas Day duel, but Kobe Bryant got the best of Carmelo Anthony this time around. Bryant registered his ninth straight 30-plus point game with 34 points and the Los Angeles Lakers avenged a loss to the Knicks earlier this month with a 100-94 triumph. New York routed Los Angeles, 116-107, on Dec. 13, but the Lakers were without Steve Nash and Pau Gasol. It was Los Angeles' last loss as it has bounced back with a season-high five-game winning streak. Nash tallied 16 points, 11 assists and six rebounds in his second game back since missing the previous 24 contests with a non-displaced fracture to his lower left leg on Oct. 31. Pau Gasol added 13 points, eight boards and six helpers in the win. Anthony equaled Bryant with 34 points for New York, which has dropped three of its last five contests to drop to 20-8 on the campaign. Bryant came in averaging 29.7 points per game, while Anthony has dropped in 28.3 points per contest. In their first matchup since June, the Heat once again proved to be too much for the Thunder to handle. Behind 29 points, nine assists and eight rebounds from LeBron James, the Miami Heat outlasted the Oklahoma City Thunder, 103-97, in a rematch of last season's NBA Finals. Dwyane Wade chipped in 21 points and Mario Chalmers poured in 20 for the Heat, who captured their fifth straight win. After having their 12-game win streak snapped by the Minnesota Timberwolves on Thursday, the Thunder have now dropped two in a row. Kevin Durant paced Oklahoma City with 33 points and seven rebounds while Russell Westbrook posted 21 points and 11 boards for the Thunder, who dropped their fifth straight contest to the Heat dating back to the 2012 NBA Finals. The Heat defeated the Thunder in five games during last season's championship round. All five Houston starters finished in double figures on Tuesday, led by James Harden's 26 points, as the Rockets routed the Chicago Bulls, 120-97, at United Center. Omer Asik and Jeremy Lin each recorded double-doubles in the victory, Houston's fourth in a row and sixth in its last seven games. 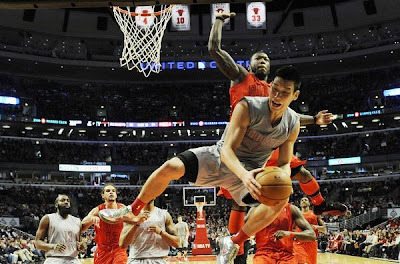 Asik tallied 20 points and a game-high 18 rebounds, while Lin donated 20 points and 11 assists. Chandler Parsons poured in 23 points and Marcus Morris added 10 in the win. Nate Robinson came off the bench and scored a game-high 27 points, while Luol Deng added 14 points and five boards for the Bulls, who have lost two straight. Jamal Crawford poured in 22 points off the bench, as the Los Angeles Clippers extended their franchise-record winning streak to 14 games on Tuesday with a 112-100 triumph over the Denver Nuggets at Staples Center. Matt Barnes also came off the bench and added 20 points, while Chris Paul finished with 14 points, eight assists and three steals for the Clippers, who own the best record in the NBA at 22-6. Kosta Koufos paced the Nuggets with 16 points and 10 rebounds and Ty Lawson chipped in 15 points and five assists in the setback, Denver's second in its last three games.